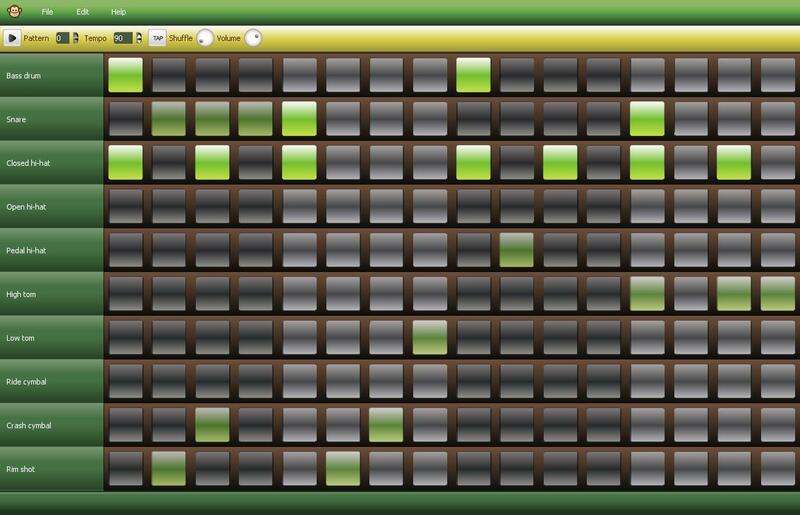 Monkey Machine is a virtual drum machine, free available as web app. Useful to make loop or simple rhythms for your performance. It happened to me, playing a synthesizer, to have the need for a rhythmic loop in place of cold and boring metronome, although effective, to support the performance. Punctually, I found myself open to some software such as Reason, Cubase or Reaktor, only to realize a rhythmic loop. When I found this online application honestly seemed very useful, not only for my personal purpose. As soon as you realize immediately taken into account that the samples are not even as bad as I myself would have expected, plus there are also several features that make this easy software rather interesting, given the gratuity. 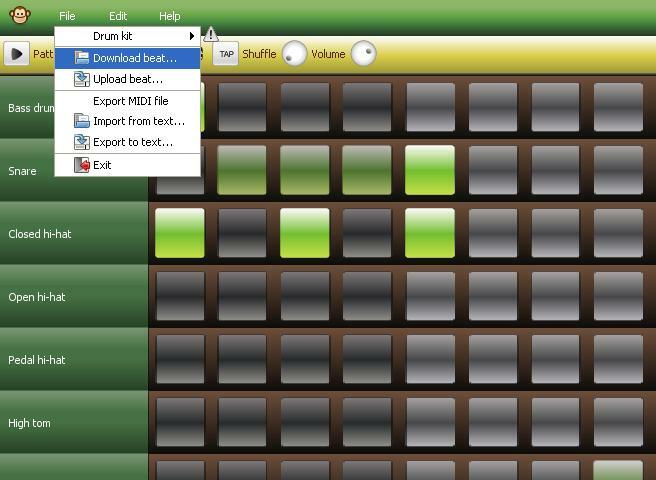 Among the features we can highlight I would start from the File menu, from which you can select your favorite Drum Kit, including about twenty types, or you can export the pattern in Midi format that we created. There is an equally interesting aspect that makes this drum machine a little social app: you can also download the patterns created by other users, so how can we share with others our own. From the FILE menu, you can download and use the rhythm patterns of other users, selecting Download Beat, or upload our own, by selecting Upload. In the Edit menu you will find the classic commands to copy, paste or cut sections of the pattern. Under the menu, however, there are a series of commands that allow you to start or stop playback, set the time or volume, working on a pattern or another, and so on. Under the menu we have the working section. On the left are listed the elements of the selected drum kit: clicking with the mouse, you can hear a preview of the sample. At the center we have the grid of the sequencer. Every note, represented by the sort of square button,s can be pressed twice, getting a different dynamic with each click. With the third click instead the note is deleted. In the upper left is the Play and Stop button. By starting the sequencer we can listen to what we have written, or write during execution, in order to have a clearer idea of ​​what we are doing. At the end of all our work, the project can be exported in Midi format, to import it into other music software. The Drum Kit already loaded were made ​​with another virtual drum machine quite advanced of which I wrote recently: Hydrogen. Monkey Machine is a no-frills software, which performs its job well, without too much complicate the lives of users that use it. Free online availability make it a useful tool that can be used even when we do not have the laptop with us with our software installed. Monkey Machine is certainly not the only drum machine online but still one of the most interesting that I’ve ever found (like this for example). And you? Do you know someone else? Probably, but it’s only for funny! Right! There’s some problem with java! Thank you Steve for your comment!